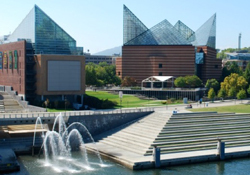 Chattanooga, Tenn., is dubbed the Scenic City. And for good reason. Straddling the transition of the Appalachian Range and the Cumberland Plateau, “the Noog” sits in the shadow of Lookout Mountain and is cleaved in two by the Tennessee River. With such an embarrassment of Mother Nature’s riches, it is perhaps no surprise that it has earned a reputation as a hub for outdoor activities. But, this quintessentially Southern city at the junction where U.S. Highways 24, 59 and 75 meet, and about two hours north of Atlanta, has more to offer than access to the great outdoors. With a bustling downtown boasting shopping, a wide range of restaurants, a developed riverfront area, a vibrant arts district and the wonderland that is the massive Tennessee Aquarium, you could spend a weekend in just the city center. So do both. Immerse yourself in Chattanooga’s culture and then head off into its outskirts for some time spent amid the area’s striking scenery. Start your visit on a full footing with a morning meal at Aretha Frankenstein’s. Hidden in a residential section on the north shore of the river, it serves heaping helpings of scary-good breakfast foods from 7 a.m. to midnight daily in a tin-topped, teal-sided house. Slightly spooky but mostly just strange decor dominates the small (always packed) dining room, including posters and photos honoring the monster whose name the eatery borrows. If you can finish a fat stack of fluffy chocolate chip pancakes, you’ll be good till dinner. Leave Aretha’s and head across Veteran’s Bridge to arrive in the Bluff View Arts District. On a hillside overlooking a wide swath of river below, a winged metal man is frozen a millisecond before taking flight, his toes just brushing the grass, a wide open sky before him. Part of the sculpture garden on the edge of the district, he’s only one of many works ranging widely in size, material and style on display among manicured shrubs and ornamental trees. Several small galleries line the steeply inclined streets, places like River Gallery, with earth-toned pottery and paintings, and The Houston Museum of Decorative Arts, showcasing Victorian art glass and antiques. Take a moment here to bask in the light caught and reflected by brightly hued, delicate glass formed into myriad shapes. The Hunter Museum of American Art crowns the crest of the bluff, and its walls and halls are lined with the results of creativity flowing from our countrymen’s (and women’s) minds and hands. If you played it safe at breakfast, you’re probably ready for a light lunch. A soothing bowl of tomato soup and cup of high-octane black gold at Rembrandt’s, tucked on the ground floor of one of the district’s towering Tudor-style buildings, provides the necessary boost for an afternoon of shopping. Hit Main Street first and start with a stop in Area 61, a haven stuffed with eclectic furnishings and décor, most of which are handmade by locals. Note the copper and turned-wood speaker systems that are fully functional works of art. Cotton & Twine offers on-trend ladies’ clothing as well as some stylish jewelry, including dainty polished-stone necklaces in stunning shades. Look for the chugging steam engine in the sky and head that way to find the Chattanooga Choo Choo Hotel, a historic property built into a circa 1909 Southern Railway terminal station. Step into the lobby and tilt your eyes up. The magnificent glass dome ceiling pairs with two large arched windows to flood the space with natural light. You’re probably not hungry again, but need is incidental when chocolate is concerned, so pop inside the Hot Chocolatier next door. Nosh on colorful macaroons and other artisan sweets and warm yourself from the inside out with a heavenly scented and rich, subtly sweet tasting vanilla-lavender hot chocolate. Go ahead and grab a bag of red-velvet chocolate-covered dried cherries to take the edge of any future munchies. Hop a ride on the electric trolley (a pick-up point is back at the Choo Choo) and continue browsing and buying at Warehouse Row, a collection of chic boutiques and national chains housed in a line of old manufacturing buildings. Lines Orchids is an upscale florist specializing in the exotic blooms, as well as succulents and air plants (frilly, fern-like flora that thrive sans soil). Home decor items and gifts fill in the rest of the space in this oasis of green growing things. Shadowbox Paperie will fulfill any desire for fine journals, letterpress stationary, leather-bound day planners and exquisite (expensive!) wrapping papers. When you’re done meandering through this grouping of retail offerings, you don’t have to go far for dinner. Awash in white and wood tones, Public House at Warehouse Row offers the comforts of classic Southern favorites with a fine-dining touch that’s sophisticated but never stuffy. The pimento cheese and bacon burger is simple and delicious, a never-fail choice. But the veggie platter affords the chance to experience several slightly elevated yet still traditional Southern dishes as well as more global players all on one plate. Try a foursome of homey grits; sweet and soft creamed corn; kale, golden raisin and peanut salad; and earthy roasted beets embellished with crumbles of tangy goat cheese. End the evening with an after-dinner drink at The Social, under the same ownership as The Public House and also in Warehouse Row. On the sugary side, the Public Knowledge blends pineapple-infused gin with sparkling lemonade and a pinch of refreshing mint. 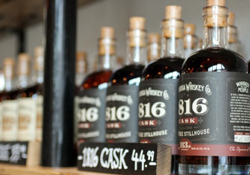 The Rookie in a China Shop makes good use of Chattanooga Whiskey Company’s “brown water.” Its deep char flavor is accentuated with ginger beer, curaçao and crème de cacao. Go back to Main Street downtown and begin at Bluegrass Grill. Don’t skimp here. You’ll need a lot of energy for an action-packed day two. 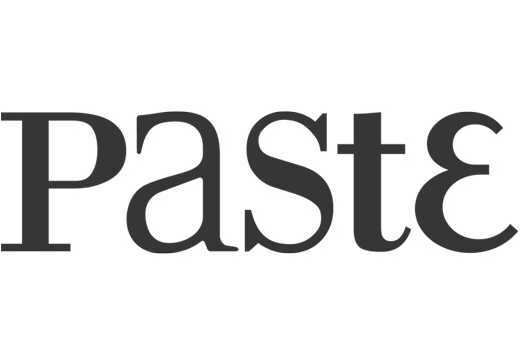 This family owned and operated eatery (mom’s in the kitchen; kids are traversing the worn-wooden floors taking orders and plopping plates of palate-pleasing dishes on tables) excels in humble but hearty fare. The basic meat-and-cheese omelet features an airy egg blanket studded with your choice of both; sharp cheddar plays nicely with jalapeño bacon whose heat sneaks in behind a smoky, salty crunch. 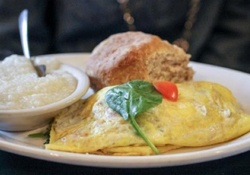 Marie’s omelet, named for the place’s matriarch, is folded around ooey gooey herbed cream cheese. Both come with a warm whole-wheat biscuit, useful for scooping up leftover smears of Marie’s rich filling. Next, plan to spend an hour or two at the Tennessee Aquarium. You can’t miss its glass-paneled ceilings, jutting up and out from the top of its two buildings like massive fins that are visible from miles away. The Ocean Journey exhibit is swimming with rainbow-colored schools of reef fish and usual suspects like sharks and rays, but the aquarium sets itself apart with its emphasis on freshwater species. The River Journey exhibit traces the flows of major eastern American Rivers and spotlights Southeast natives that live in these habitats like otters, trout, alligators and turtles. 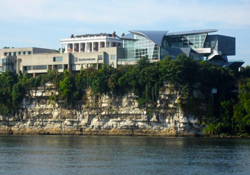 The IMAX theatre has a rotating schedule of educational and entertaining films that leap off the screen, and the River Gorge Explorer offers a tranquil trip down the Tennessee River. Leave the wide-open spaces of the aquarium for Opa, a tiny Greek restaurant facing the water on the opposite side of the river. Three tables crammed between whitewashed brick walls and stone floors are the setting for a lunch overflowing with flavor. A chunk of fork-tender and perfectly seasoned roasted lamb rests on fresh pita triangles with rice-stuffed grape leaves (grown out back and brined in-house) and zippy tzatziki sauce on the side. Wash it all down with a red solo cup full of pomegranate-infused green tea. After lunch, get outside. Play at Coolidge Park, complete with grassy fields, a rock-climbing wall, gurgling, interactive fountains and an antique carousel. Sit back and soak in the views during a Southern Belle riverboat cruise. Trek beneath blue trusses as you cross the river on the Walnut Street Walking Bridge, the oldest surviving bridge of its type in the South and one of the longest pedestrian bridge in the country. Back on the south shore of the river, explore the multiple activity options at the Riverpark. Fish off piers, meander around wetlands, and walk, run or bike on the Riverwalk, a 13-mile greenway running along the river’s banks. Or leave the city center for a few hours in lieu of nearby adventures. Ringed by tree-topped ridges, Chattanooga is a perfect home base for the many outdoor pursuits surrounding it, including one of the area’s iconic attractions on top of Lookout Mountain. 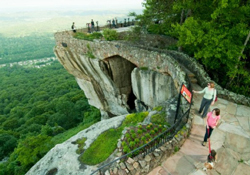 Hosting visitors since 1932, Rock City was a pioneer in alternative marketing, coaxing quite a few landowners in Alabama, Georgia and Tennessee to emblazon their barn roofs with the phrase “See Rock City” in the 1930s. The deal was simple; a Rock-City-hired painter would give their structures a fresh coat for free in exchange for allowing him to add the now-famous imperative. The spot celebrates the mountain summit’s lush woodlands and glens, amazing (and ancient) sandstone formations and caves and all the wildlife they contain with trails, gardens and dramatic cliff views, one that spans seven states. Claustrophobes should avoid Fat Man’s Squeeze, a sliver of path that leads between two perilously close giant boulders. Come down off Rock City’s high and check out Ruby Falls, a sparkling cascade gushing gallons of tumbling water over a precipice in a cave that’s more than 1,100 feet beneath the surface of Lookout Mountain. For more thrills, take a roller-coaster raft ride down the Ocoee River. The site of the 1996 Olympic kayaking events, this stretch of continuous whitewater action promises bounces and dips, splashes and spins over rapids with names like Broken Nose, Hellhole and Tablesaw. About 45 minutes from Chattanooga, several outfitters like Ocoee Rafting right on the river provide all the needed gear and expert guides. Back in downtown Chattanooga, a feast awaits in the contemporary yet cozy confines of Terramae, a bistro in the Dwell Hoel. Start with the Appalachian Lunchable, a board mounded with plenty of sweet and savory snacks to share including pickled shrimp and veggies, rosemary biscuits with tart blackberry jam, country ham, a pungent smoked gouda spread, benne-seeded bacon and deviled eggs. Finish with more pig, the porterhouse pork chop and grilled Andouille sausage with potato salad and rustic succotash. If you’re up for a few more hours of fun, bowl a few frames, puff on a cigar and down some drinks at Southside Social, a two-story “boutique” (read upscale) bowling alley with three bars, full food service and 10 lanes plus pool tables, darts, an outdoor bocce court and the appropriate amount of “Big Lebowski”-themed pop art. The Dwell Hotel (right next to Terramae) is located downtown and offers relaxed and but refined rooms. Exposed brick walls and claw-foot tubs remind you of the building’s age, while free Wi-Fi and flat-screen TVs ensure you’ve got the modern comforts you’re used to. Don’t miss the complimentary wine and cheese available in the charming parlor on Friday and Saturday evenings. Sip and nibble while lounging on the couch or in one of several plush chairs. The Bluff View Inn occupies three turn-of-the-century homes that overlook the river in the heart of the art district and is within walking distance of the galleries and museums as well as the aquarium and the Walnut Street Walking Bridge.